1) You know your a runner when you are thrilled to get Band-Aids, Body Glide and socks in your Christmas stocking. 3) You know you’re a runner when you’re not afraid of port-o-potties! 4) YAY!!! Me!!! I am all about comfy shoes now and NOT heals. Maybe once in a blue moon. I have some platform type things that are about a 1″ heel. 11) When you tell someone, no I can’t commit to anything else, I’m training for my first half marathon. 12) You know you’re a runner when the family get together ALWAYS seem to fall on race weekend. 14) When you have a mild anxiety attack when you’re local chain pharmacy is out of KT tape, lol! 16) When you don’t have another beer so you won’t feel like crap for the next mornings run! 17) When you have more running shoes in your closet than any other type of shoe…..
22) When you’re so used to blowing/wiping your nose on your shirt during runs that during allergy season in your house you start to raise your shirt instead of looking for a kleenex before you realize what you are doing!!! LOL!!! 23) when you feel an uneven walking surface! 24) you eat at different times than the family so your bodily functions are less likely to affect your running for the day. 25) You have a frustrating day at work and you can’t wait to beat a few miles out to center yourself. 26) When you get excited to get running clothes, accessories, equipment. Also when you pass on snowboarding and any other sports that use your legs to save your legs for a race. 27) When the places you used to drive to run, you now run to and run! 29) You have multiple tan lines from your various running clothing. And you pick out sunglasses based on how they will sit while you are running. 30) When you go out to the car and you forgot something from the house and instead of walking back to house, you RUN! 31) When a non runner friend starts talking about how “awesome their day was” and all you hear is blah blah blah because you haven’t gone for your run. 32) When you find yourself driving on the left side of the road when you’re on your running route or the local 5k route! 33) when a fun event is coming to town (a ROC, obstacle course based on Wipeout type theme!) 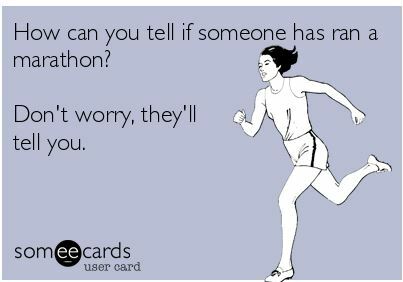 but it is 2 weeks before 1/2 marathon, and just CANT risk injury!